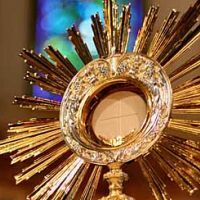 Eucharistic Adoration is adoring and honoring the Eucharistic Presence of Jesus Christ. 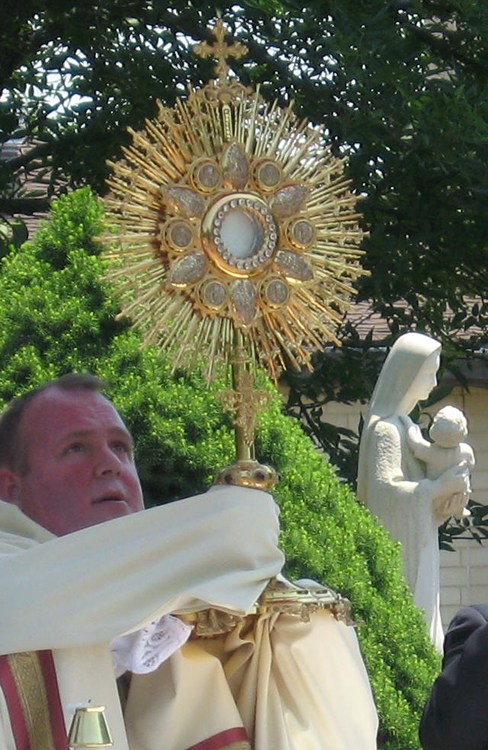 The Eucharist is Jesus truly present- Body, Blood, Soul, and Divinity. 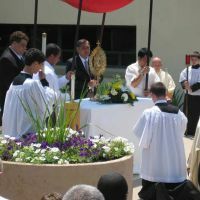 He comes to us at the moment of consecration during the Mass. The gifts of bread and wine are transformed (transubstantiated) into the actual Body and Blood of Christ. 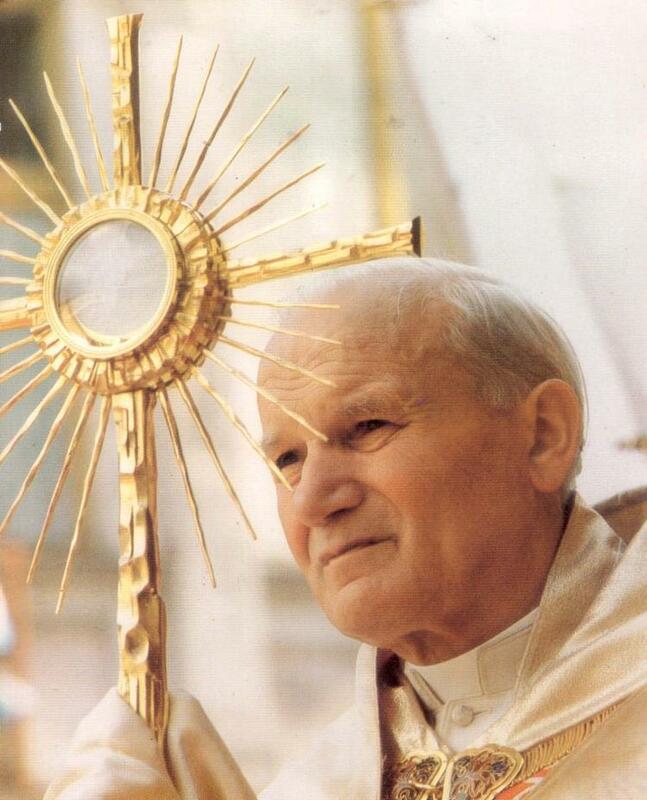 The elements retain the appearance of bread and wine, but are indeed the actual Body and Blood of Christ. 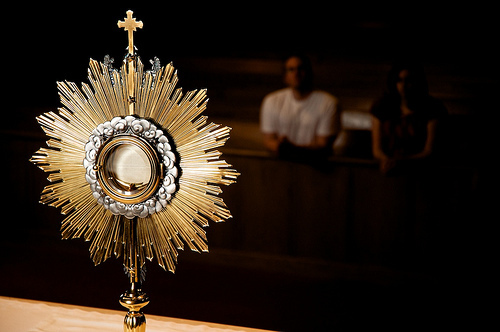 This is what the Real Presence means. 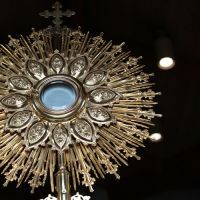 It is the actual, physical presence of Jesus in the Eucharist. 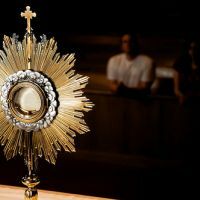 During Eucharistic Adoration, we “watch and wait” in silence in His Presence, (Could you not stay awake with me for even an hour?” Mt. 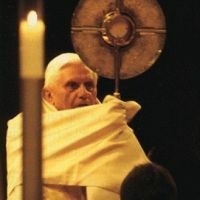 26:40). 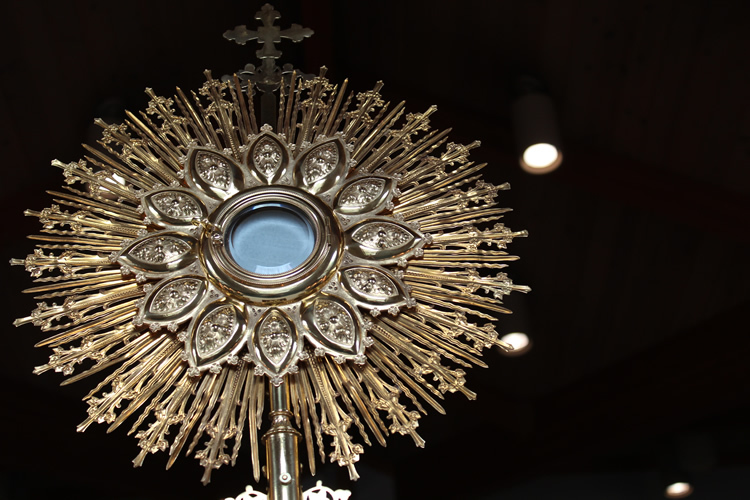 We open ourselves to God’s graces which flow from the Eucharist. 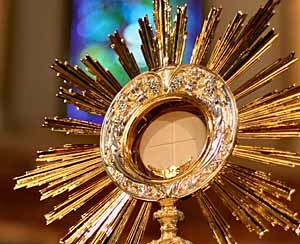 Through worshiping the Eucharistic Jesus, the Lord draws us to Himself, and we can be transformed; we can become what God wants us to be. 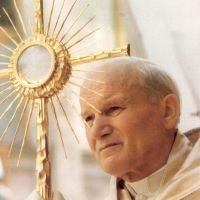 "Throughout the culture and on today's modern campuses students are bombarded with so many seductive images and ideas to tempt them that they might easily lose sight of the importance of their values and Catholic faith. 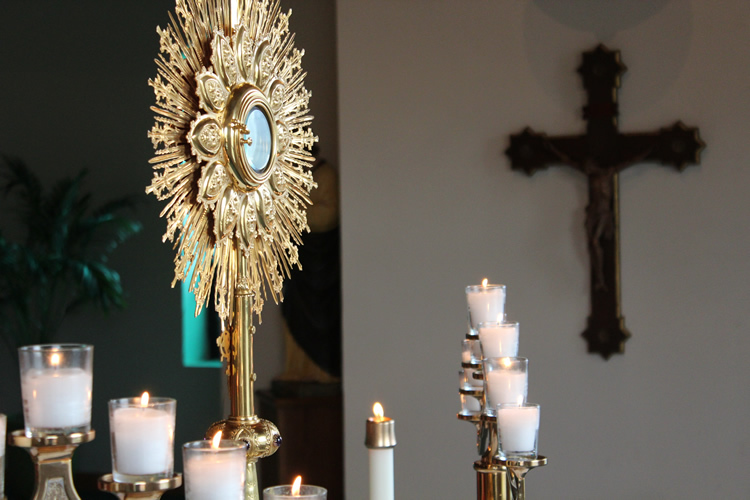 Our mission is to help students by strengthening their faith through Eucharistic Adoration. 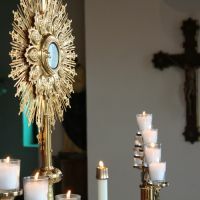 The CNS Adoration Campaign promotes the tradition of Eucharistic Adoration to students and campus ministers.In the Fall of 2007 CNS began working with the Real Presence Association to bring the Vatican's International Exhibition Eucharistic Miracles of the World to students throughout the country. Since then, countless students have been impacted by the power of the exhibit." 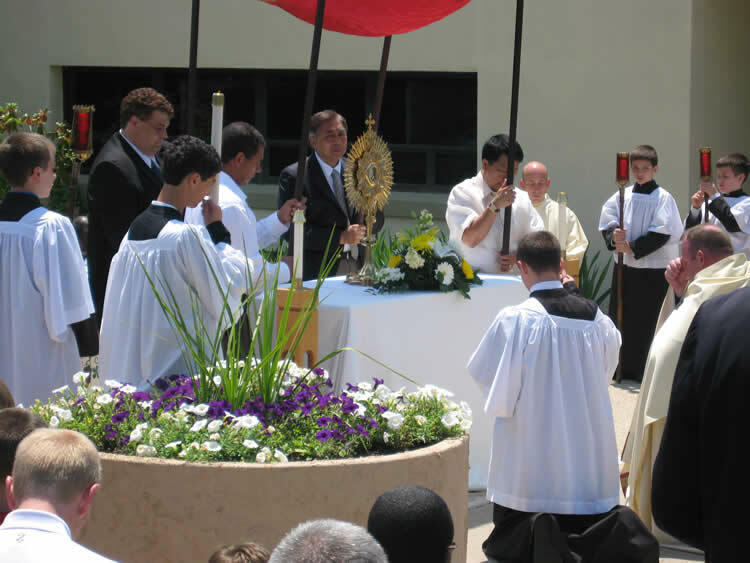 Adoration is held in the Sacred Heart Chapel, located inside the main church entrance to the right. 9:30am Friday - 7:50am Saturday. 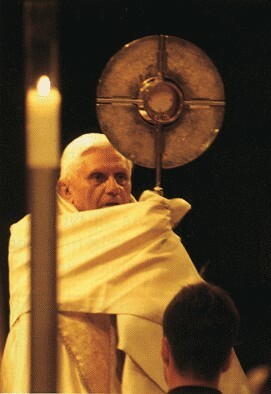 Benediction at 7:30pm and simple reposition at 7:50am. 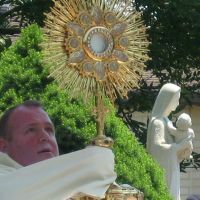 Read the weekly column from the bulletin and strengthen your understanding of Eucharistic Adoration.